KE00006 is a solid phase sandwich Enzyme Linked-Immuno-Sorbent Assay (Sandwich ELISA). 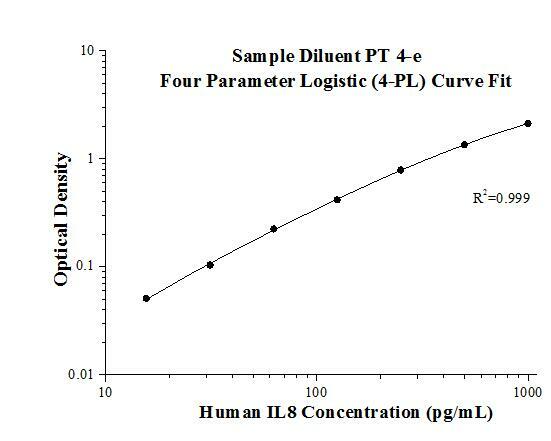 The IL8 ELISA kit is to be used to detect and quantify protein levels of endogenous IL8. 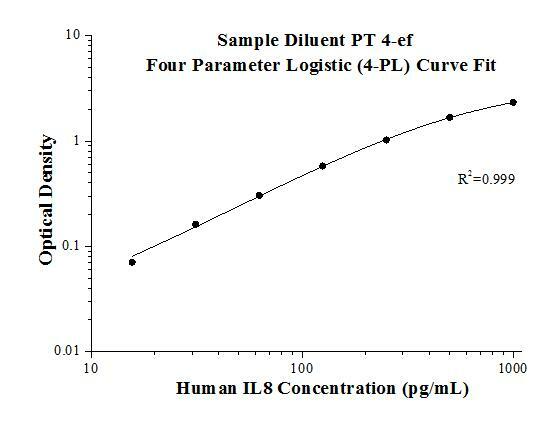 The assay recognizes human IL8. A polyclonal antibody specific for IL8 has been pre-coated onto the microwells. The IL8 protein in samples is captured by the coated antibody after incubation. Following extensive washing, a monoclonal antibody specific for IL8 is added to detect the captured IL8 protein. For signal development, horseradish peroxidase (HRP)-conjugated Anti-mouse antibody is added, followed by Tetramethyl-benzidine (TMB) reagent. Solution containing sulfuric acid is used to stop color development and the color intensity which is proportional to the quantity of bound protein is measurable at 450nm with the correction wavelength set at 630 nm. Interleukin 8 (IL8), also known as CXCL8, which is a member of the CXC chemokine family. This chemokine is secreted by a variety of cell types including monocyte/macrophages, T cells, neutrophils, fibroblasts, endothelial cells, and various tumor cell lines in response to inflammatory stimuli. IL8 has two primary functions. It induces chemotaxis in target cells, primarily neutrophils but also other granulocytes, causing them to migrate toward the site of infection. IL8 also induces phagocytosis once they have arrived. This gene is believed to play a role in the pathogenesis of bronchiolitis, a common respiratory tract disease caused by viral infection. IL8 is also known to be a potent promoter of angiogenesis. IL8 has been associated with tumor angiogenesis, metastasis, and poor prognosis in breast cancer. IL-8 may present a novel therapeutic target for estrogen driven breast carcinogenesis and tumor progression. Synthetic lethal short hairpin RNA screening reveals that ring finger protein 183 confers resistance to trametinib in colorectal cancer cells. RNF183 promotes proliferation and metastasis of colorectal cancer cells via activation of NF-κB-IL-8 axis. Non-thermal atmospheric pressure plasma-induced IL-8 expression is regulated via intracellular K+loss and subsequent ERK activation in human keratinocyte HaCaT cells. IL-8-induced O-GlcNAc modification via GLUT3 and GFAT regulates cancer stem cell-like properties in colon and lung cancer cells. Carboxymethyl chitosan nanoparticles loaded with bioactive peptide OH-CATH30 benefit nonscar wound healing. Analysis of curative effect of adjuvant therapy with bronchoalveolar lavage on COPD patients complicated with pneumonia.